Simple stitching is always in season! Showcase seasonal delights in quick-to-sew projects featuring sprinkles of embroidery, patchwork, and applique. Whimsical motifs capture everyday pleasures, from springtime flowers and buzzing bees to plump pumpkins and frosty snowmen. 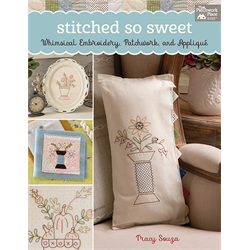 Charming touches such as prairie points, wool applique, and big-stitch quilting give each project its pop. Create mix-and-match pillows, framed embroideries, and needle books, or make a four-season quilt, table topper, or wall hanging that can be enjoyed year-round. Perfect for decorating and gift giving!